We bring you our Giants at Titans preview as the 2-10 Tennessee Titans enter a three game stretch best described as the “Battle for the Top Pick.” In order, they face the New York Giants, New York Jets and Jacksonville Jaguars in the next three weeks. They finish the season at home against the Indianapolis Colts. As it stands, the Titans own the 3rd overall pick but that could change given the upcoming trilogy. The Jaguars (2-10) own the 4th pick, the Jets (2-10) own the 5th pick while the Giants (3-9) own the 7th pick. For the moment at least, the Oakland Raiders (1-11) have the number one overall pick nailed down. The truth is none of these teams are very good and the top of the draft order is up for grabs. Turning to the game, both of these teams are banged up with the Giants hoping running back Rashad Jennings can play since the team faces the league’s worst run defense in the Titans. The Titans are giving up on average 141.5 rushing yards per game and have allowed big rushing games to virtually every back they have faced. The Titans on the other hand are a Mash unit along the offensive line with center Brian Schwenke already on injured reserve where he joins former starting left tackle Michael Roos. Roos’ replacement rookie Taylor Lewan has a high ankle sprain and missed Week 13’s game against the Houston Texans as did right tackle Michael Oher who is dealing with a toe injury. The Giants run defense isn’t much better than the Titans which might be good news if not for the injuries along the offensive line. Also, since the Titans are allergic to running the ball it doesn’t matter anyway. The Titans average 88.3 rush yards per game. The most striking contrast between these two teams, which are eerily similar by the numbers in many respects, is in the 3rd down conversation rates on offense and defense. The Titans aren’t even converting 30% of their third down opportunities (29.4) AND have the league’s worst third down opportunity stats with only 136. By contrast, the Giants convert 43.8% of their third downs and have 169 third down attempts. Another interesting tidbit here and that is the Titans average 16.8 first downs per game which is a league second worst to the Raiders who average 15.3. The Giants average 21.6 first downs per game. Meanwhile, the Titans on defense give up a whopping 44.3% conversion rate on third down. The Titans are a -6 in the takeaway differential and allow opposing teams to dictate the flow of the game offensively. 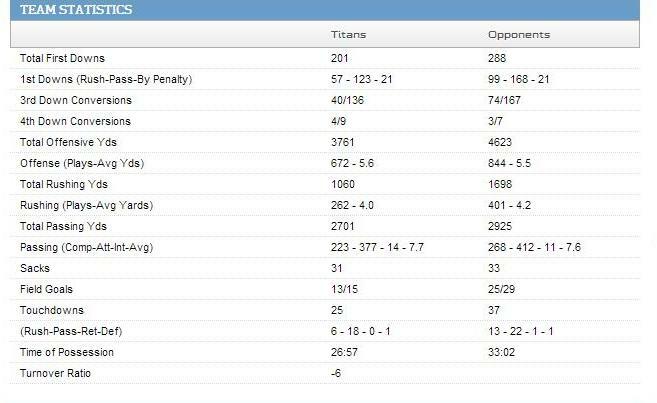 These two defenses are remarkably even by the numbers but the Titans might be too banged up to capitalize offensively. They just placed second year wide receiver Justin Hunter on injured reserve with a lacerated spleen where he will join tight ends Craig Stevens and Taylor Thompson. 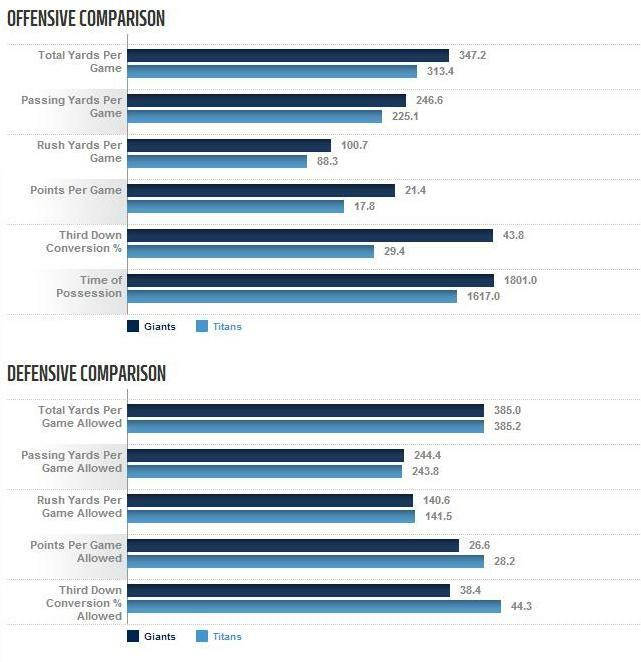 The Titans offense ranks at the bottom of the league in virtually every category. For the Titans defense, if Jennings doesn’t play it will be rookie Andre Williams who is slowly improving for the Giants but hasn’t yet taken that step toward showing he can be a feature back. Behind him it’s likely to be Chris Obgonnaya who the Giants just added. The real threat in the Giants offense is of course rookie standout sensation Odell Beckham Jr. Beckham missed the first four games due to injury and still leads the Giants in receiving yards with 699 on the year. That is more than any Titans receiver. Titans tight end Delanie Walker is close with 673 receiving yards. Beckham is also averaging 87.4 receiving yards per game and has five touchdowns. Eli Manning has struggled in the new offense installed by new offensive coordinator Ben McAdoo and there are questions regarding his future. In 2013, Manning threw 27 interceptions to 18 touchdowns. To date in 2014, he has thrown 12 interceptions to 22 touchdowns. In 2013 he took 39 sacks for a loss of 281 yards. To date in 2014, he has taken 26 sacks for a loss of 170 yards. The Giants might also be headed for a split with long time head coach Tom Coughlin after the season. Coughlin is 93-79 in his eleven year coaching career with the Giants (.537) and the team has played poorly the past few years. The Giants are only three years removed from their last playoff appearance, a Super Bowl win mind you, and it could be closing time for him in New York. Meanwhile, despite a dreadful first year and many questions regarding roster management and usage, Titans CEO Tommy Smith promised no changes will be made in the front office or with the coaching staff. Per Smith, it’s entirely the fault of these bums they have out here on the field. (Please note that is sarcasm). Whisenhunt is 47-61 in his seven year head coaching career (.435). The Titans game plan should be simple. Get pressure on Manning and try to force him into making mistakes. This defense hasn’t won any games for the Titans this year but given how poorly the offense has performed, it might need to if they want to win against the Giants. These two teams have faced each other ten times with each team winning five. Eli Manning has never beaten the Tennessee Titans. He has faced them twice losing once at LP Field 24-21 during Vince Young’s rookie year. Young led a fantastic comeback effort to win that game. He also lost to the Titans in 2010 at New Meadowlands Stadium 29-10. Vegas has the Giants as a -1 favorite. The Titans are a miserable 1-4 at home this season. Thursday’s full practice report can be found here. The game kicks off at noon CDT Sunday at LP Field in Nashville, Tennessee. Thom Brennaman, David Diehl and Laura Okmin are the announcing crew. We will update you with the referee assignments when they become available. The weather in Nashville is expected to be mostly cloudy with a high of 50 degrees.